Is one of your new year’s resolutions to broaden your horizons by seeing and reading more foreign movies and books? You can start making progress on that goal the first weekend of the new year by attending the annual Scandinavian Film Festival Los Angeles (SFFLA) in Beverly Hills. It takes place the weekends of January 5 & 6 and 19 & 20. Join SFFLA as they celebrate their 20th anniversary this year! Despite its name, the scope of the festival actually extends beyond Scandinavia. Besides films from Norway, Sweden, and Denmark, you can view films from the Nordic countries Iceland and Finland as well as Baltic neighbors Latvia, Estonia, and Lithuania. At the SFFLA Opening Gala on Saturday, January 5, at 5:30 p.m., you can enjoy drinks and a buffet meal with other Scandi film enthusiasts. Gala tickets (a great deal at only $40 each!) 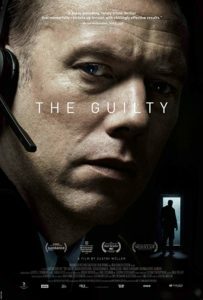 also include Opening Ceremonies at 7:15 p.m. and the screening of Denmark’s feature film The Guilty at 7:30 p.m. as well as a Q&A with director Gustav Möller. Buy your gala tickets now! 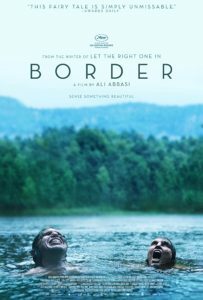 Below you’ll find a list of films by country. Descriptions are taken from the festival’s website. You can also view and download a chronological schedule. SFFLA Festival Passports which allow admission to all screenings and Opening Gala are available for $140, or you can buy tickets for individual films for $12 each online or at the door. Please confirm schedule with SFFLA as it may change after this post is published. Hope to see you there! 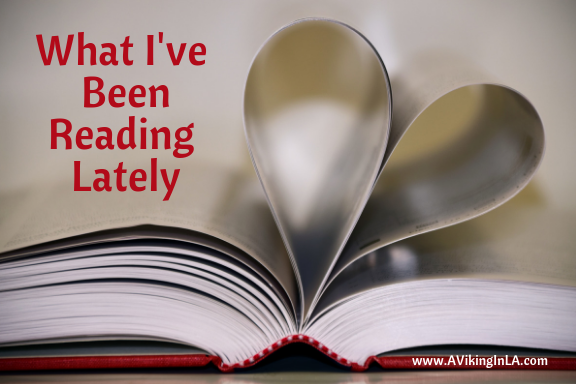 Sixteen-year-old Nisha lives a double life. When out with her friends, she’s a normal Norwegian teenager. At home with her family, she is the perfect Pakistani daughter. 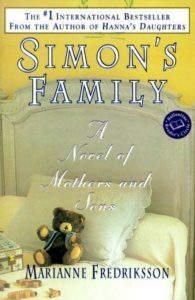 But when her father catches her alone with her boyfriend in her room, Nisha’s two worlds brutally collide. It can seem like we are living on the edge of the world. But one morning 200,000 soldiers march into our arctic landscape. Four years later they stumble out leaving everything in ruins. As if nothing has happened. What in human nature triggers violent acts of war, thousands of miles into the wild? Can it happen again? As the ice melts? 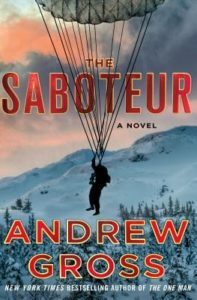 True World War II story about Jan Baalsrud, one of the 12 saboteurs sent in 1943 from England to the Nazi occupied Northern Norway. After their boat is sunk by the Germans, the Nazis killed 11 of them. The 12th man, Jan, goes on the run towards the neutral Sweden. However, the brutal weather conditions turn out to be an even greater foe than the Nazi patrols. The Green Valley is a short film that explores the connection between politics, art and daily life in a multicultural neighborhood in Oslo. 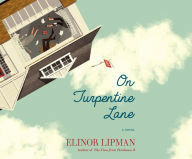 The film is inspired by three real events that took place in the director’s neighborhood. *Note: Do not confuse this film with the similarly named movie 22 July directed by Paul Greenglass which also came out in 2018. Greenglass’ work is a documentary style film based on the non-fiction book One of Us: The Story of a Massacre in Norway — And Its Aftermath by Åsne Seierstad (available to stream on Netflix), while Poppe’s film is a one-take feature shot in real time of the day the youth summer camp was attacked. Read more at Utøya-July 22 recreates the terror attack in one remarkable shot. Customs officer Tina is known for her extraordinary sense of smell – she can sniff out fear on anyone. But when Vore walks past her, her abilities are challenged for the first time. Tina can sense Vore is hiding something she can’t identify. Worse, she feels a strange attraction to him. This fateful encounter calls into question her entire existence. Chronicling the beautiful and tragic life and career of legendary Swedish singer-songwriter Ted Gärdestad, this biopic tells the story of the great highs and lows of one of Sweden’s most loved artists. Set in 1984, Hans Pettersson (Hasse P.) decides to create the largest sandwich cake ever made in order to put his hometown, Köping, on the map. 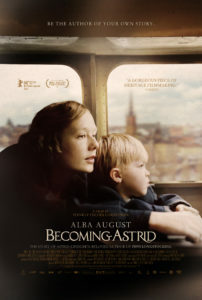 This is a biopic of Swedish writer Astrid Lindgren, the author of numerous children’s books and creator of Pippi Longstocking. 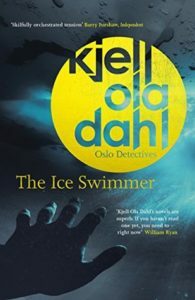 This movie is based on true events from a 2004 criminal case in Iceland where a body was discovered by chance by a diver in the Neskaupstaður harbor. Halla, a woman in her fifties, declares war on the local aluminum industry to prevent it from disfiguring her country. 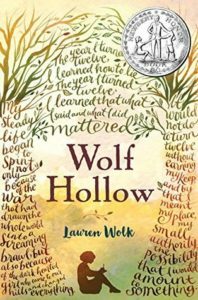 She risks all she has to protect the highlands of Iceland but the situation could change with the unexpected arrival of a small orphan in her life. 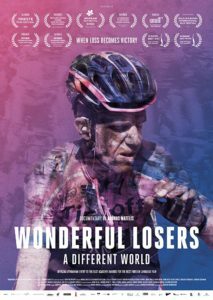 Screening: Saturday, 1/19, 5:30 p.m.
Sharp-suited Erik represents the aspirational face of modern Iceland. Atli, a petty criminal just released from prison, is stuck in a downward spiral. The distance between these two very different brothers vanishes when the duo teams up to smuggle cocaine into Iceland, inside plastic pellets swallowed by a young Polish mule, Sofia. 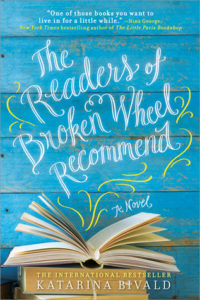 But things go wrong when rule-breaking cop Lena starts closing in on them and Sofia falls sick. With the drugs yet to reach their destination and a rival gang demanding a slice of the action, time is a luxury that the brothers can’t afford. Charismatic anti-hero Erik’s ability to stay one step ahead is tested to the limit – how many lives is he willing to sacrifice to sustain his own? 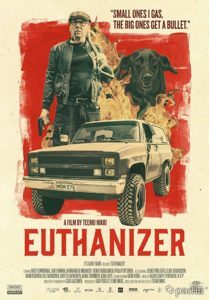 This violent summer noir tells the story of Veijo, a 50-year-old mechanic, whose second job is to put sick pets to sleep. He’s also an animal whisperer and prefers to personally deliver justice to careless owners who neglect their pets. 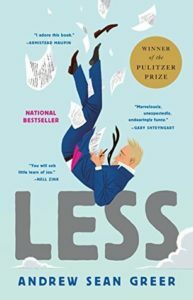 His unconventional but meticulously organized life is disrupted when he comes across Petri, a garage mechanic and member of a neo-Nazi gang, and Lotta, a young nurse who understands his psychosis. The themes revolve around animal rights, suffering and death. But the real story is not about good or evil – it’s about intolerance and the stupidity of absolute men. Based on novel of the same name by Váinö Linna, the film follows a fictional Finnish Army machine gun company on the Karelian front during the War from 1941 when the troops prepare for the invasion of the Soviet Union until armistice in 1944. The author himself had served in such a company. A Finnish superhero, a masked vigilante Rendel, seeks for revenge and fights against VALA, the huge criminal organization. An elderly art dealer Olavi (72) is about to retire. A man who has always put business and art before everything – even his family – cannot imagine life without work. At an auction, an old painting catches his attention. Olavi suspects it is worth much more than its starting price, which is low because its authenticity hasn’t been confirmed. Olavi’s instincts kick in. He decides to make one last deal in order to earn some proper pension money. At the same time, Olavi’s daughter Lea (42) – whom he hasn’t seen for years – asks him to help her with his teenage grandson Otto (15). Together with Otto, Olavi starts to investigate the background of the painting. They find out that the painting is called Christ and was painted by Ilya Repin. Olavi manages to buy the painting, but when the auction house realizes that there has been a mistake with the original pricing, they turn against him. 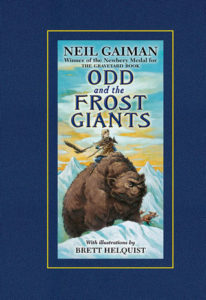 To fulfill his dream, the old dealer must face both the auction house and his own past mistakes. 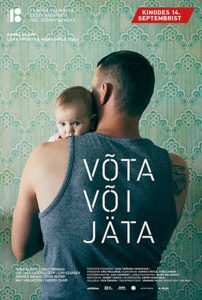 Ivars Seleckis takes a look at five children and their families from throughout Latvia. Shot over a period of two years, the film explores how choices made by adults are reflected in a child’s thinking. In the midst of the political upheaval of the early 1990s in Soviet Union, an Estonian girl and a Russian boy reach across cultural lines to unite over a shared bottle of American soda. One sleepy Saturday morning a 30-year-old construction worker Erik gets some earth shattering news: his ex-girlfriend Moonika who he hasn’t even seen for the past six months is about to go into labor. She however is not ready for motherhood and if Erik doesn’t want the kid either, the little girl will be put up for adoption. Take it or leave it! They’re called water carriers, domestics, ‘gregarios’, ‘Sancho Panzas’ of professional cycling. Always at the back of the group, with no right for a personal victory. These wonderful losers are the true warriors of professional cycling. 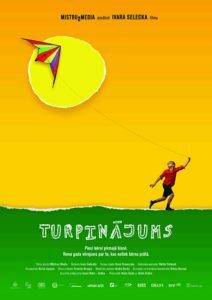 What festival films look interesting to you? I have actually already seen two of the movies to be presented, both of which I highly recommend. 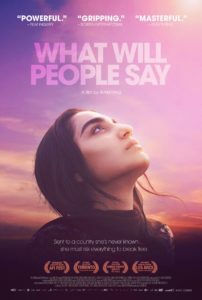 I saw What Will People Say, an #ownvoices immigrant story from Norway, at AFI Fest in November 2017. It was a moving and thought-provoking film. 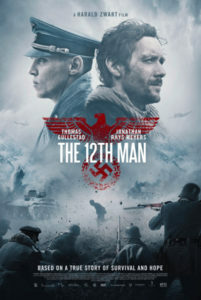 The 12th Man is an amazing World World II story of survival and will to live and kindness to others despite tremendous risk that I saw just recently at a special engagement at Museum of Tolerance. I plan to bring my family to see it at SFFLA this year. There are many films I’m personally interested in seeing. 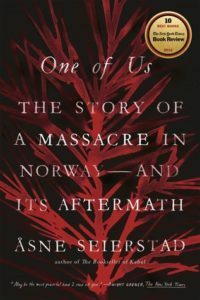 I am currently reading Åsne Seierstad’s One of Us: The Story of a Massacre in Norway — And Its Aftermath and plan to see Greenglass’ 22 July on Netflix at some point. 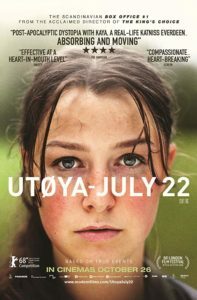 Poppe’s Utøya – July 22 seems to be a totally different take on the same event so I’m very eager to see that, though I think it will be an extremely tough film to watch. 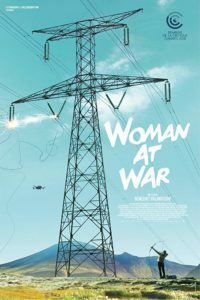 Other films at the top of my to-watch list are Sweden’s Border, Denmark’s The Guilty, and Iceland’s Woman at War. Can’t wait for the screenings to start. Will I see you there? 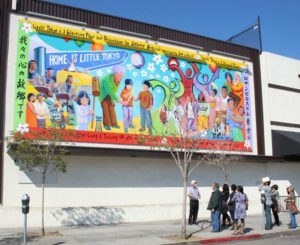 Los Angeles is one of the most diverse metropolitan areas in the United States. Here are some special events happening in LA this month. Mark your calendars, but please check suitability for family members and confirm dates and times before heading out. For Scandinavian enthusiasts, October continues to offer events that may be of interest. 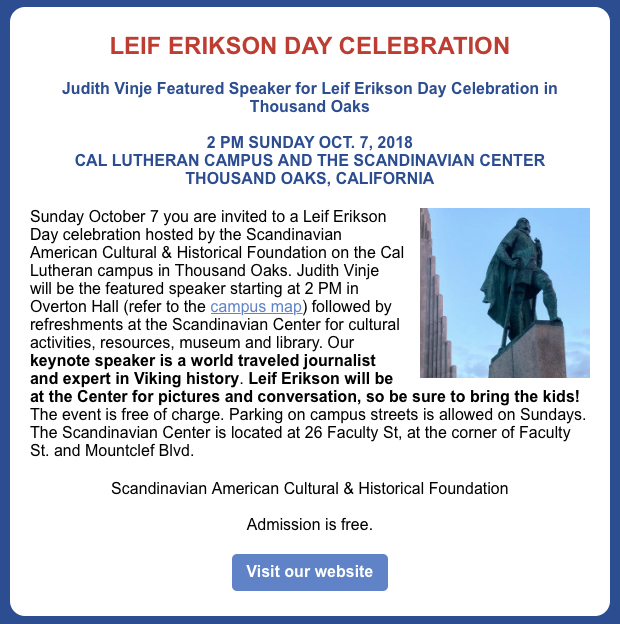 On Sunday, October 7, the Scandinavian American Cultural and Historical Foundation will host its annual Leif Erikson Day Celebration. Judith Vinje, a world traveled journalist and expert in Viking history, will be the keynote speaker at a presentation which will be followed by a reception at the Scandinavian Center. Leif Erikson will be at the Center for pictures and conversation, so be sure to bring the kids! The event is free of charge. 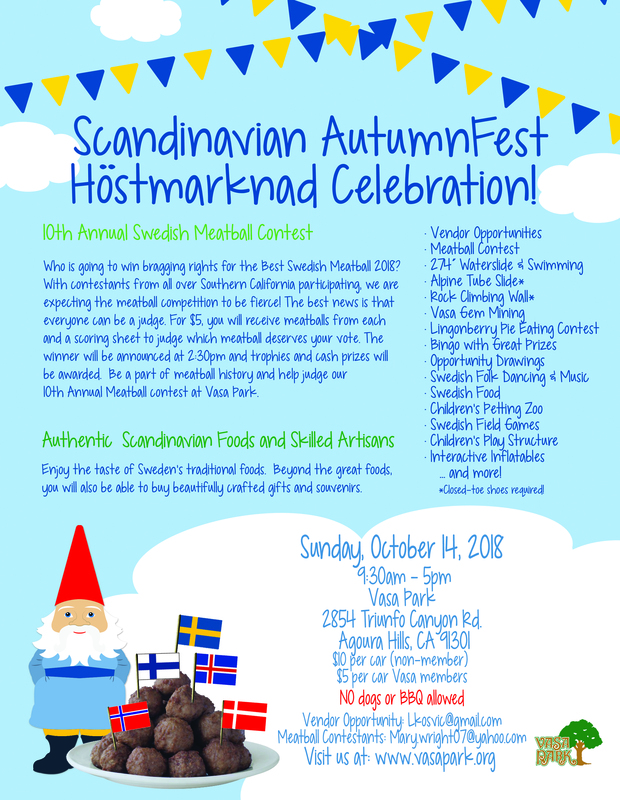 The following weekend, on Sunday, October 14, Vasa Park Association will host their annual Scandinavian AutumnFest & Höstmarknad Celebration in Agoura Hills which includes a Swedish meatball contest. More details can be found in the listing below. 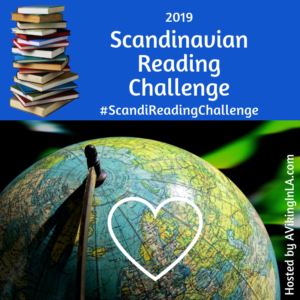 On Thursday, October 25, the Scandinavian American Cultural and Historical Foundation‘s Scandinavian Book Club resumes its monthly meetings after a long summer break. Please reach out if you’re interested in details. 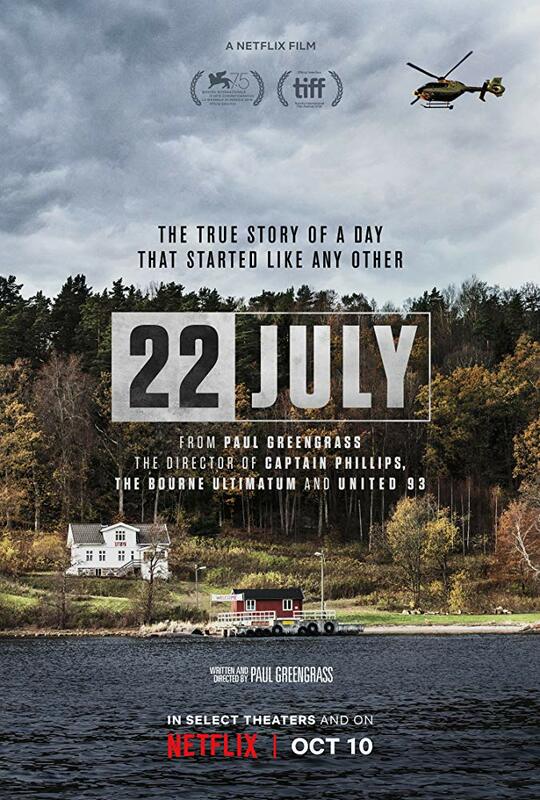 And finally, news for Scandinavian enthusiasts and film buffs beyond Los Angeles, Netflix is releasing the movie 22 July, a drama about the 2011 terrorist attacks in Norway that claimed the lives of 77 people and the aftermath, on October 10 both on its streaming platform and in select theaters around the world. The film is based on the book One of Us: The Story of Anders Breivik and the Massacre in Norway by Åsne Seierstad, translated from the Norwegian by Sarah Death. The movie is written and directed by Paul Greengrass. 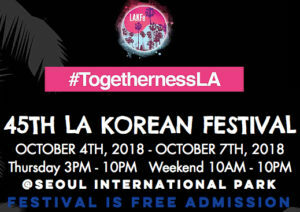 Los Angeles Korean Festival, Seoul International Park, Normandie & Olympic Blvds, Thursday, 10/4 – Sunday, 10/7. This is a free four-day festival whose mission is to provide the community with the best possible outlet to learn about the roots and traditions of Korea. Entertaining performances will lighten up the festival’s main stage. Thoughtful cultural exhibitions will educate visitors about South Korea’s history and culture. Local restaurants as well as vendors from South Korea will present a wide variety of food in one space. The shopping space will consist of booths selling Korean products such as cosmetics, appliances, apparel, and accessories. 7th Annual San Pedro International Film Festival, various locations in San Pedro, Friday, 10/5 – Sunday, 10/7. The San Pedro International Film Festival (SPIFF) was founded to celebrate the diverse culture and community of San Pedro with a wide spectrum of independent film, documentaries, and shorts. SPIFF is committed to exhibiting films that embody inspiring entertainment for all, works that express fresh voices and differing global perspectives, with the intent that these films enlighten audiences while providing invaluable exposure for filmmakers, local and international. L.A. Greek Fest, Saint Sophia Cathedral, Pico & Normandie Blvds, Friday, 10/5 – Sunday, 10/7. The L.A. Greek Fest is the largest and most iconic Greek food and wine festival in Los Angeles, California, bringing over 15,000 attendees together for a three-day weekend of all things Greek. Each day of festivities is a celebration of food, wine, dance, games, performances, and one-of-a-kind cultural experiences. Located at Pico and Normandie on the same grounds of one of LA’s most beautiful and well-known Greek Orthodox cathedrals, Saint Sophia Cathedral, the festival brings together the community of the Byzantine-Latino Quarter and people from all over downtown Los Angeles and Southern California. Visit website for schedule of events and $2 coupon. 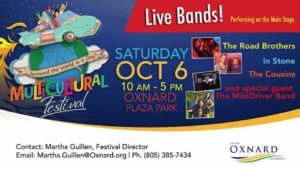 Around the World in a Day Multicultural Festival, Oxnard, Saturday, 10/6, 10:00 a.m. – 5:00 p.m. Visit Oxnard for a day of music, dance, and cultural booths from around the world. The festival features live music and performers, food and vendor booths, exhibitors, demonstrations, arts & crafts, and plenty of family friendly activities. Every year, hundreds of guests look forward to coming together to celebrate the many diverse nations, languages, and cultures of the world. 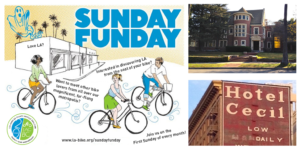 Sunday Funday: A Haunted Pedal, Meet at The Crafty Pedal, Downtown LA, Sunday, 10/7, 9:30 a.m. Explore Downtown LA in a unique way. The first stop on this haunted ride is the “Murder House” from season one the FX television series, American Horror Story. Then, the group will take a short ride over to Rosedale Cemetery, built in 1884, the first cemetery in Los Angeles open to all races and creeds. Many founding Angelenos rest in these beautiful garden grounds. Next, the ride goes toward the haunted and infamous Cecil Hotel in Downtown LA, past home of the Night Stalker, and the site of other mysterious happenings. Finally, the group rides to Pershing Square, where you’ll hear stories of the historical haunts of the Millennium Biltmore Hotel. Ride finishes back at The Crafty Pedal. Visit website for important details on the ride. 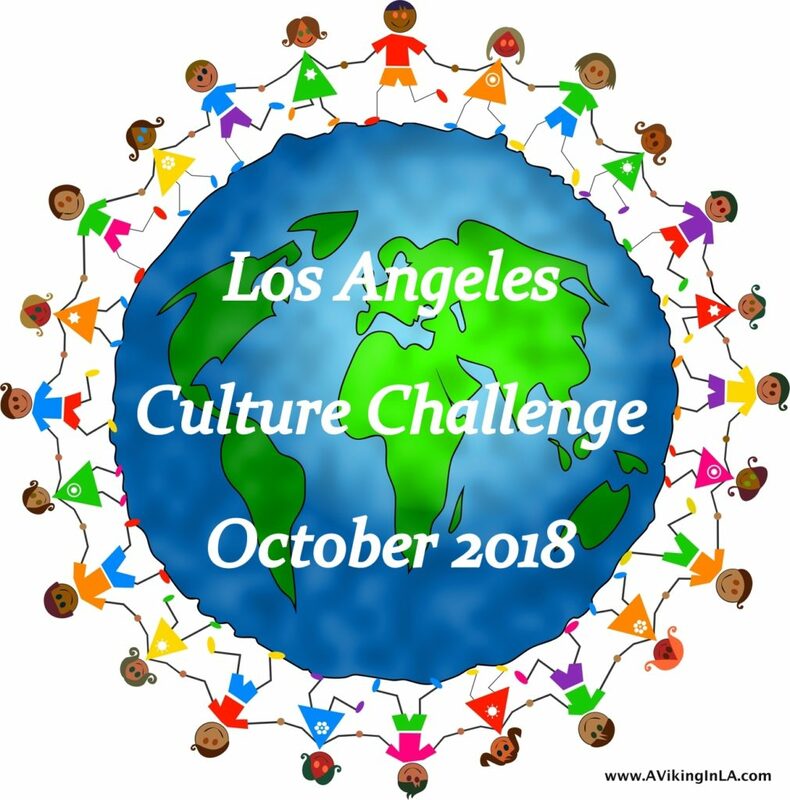 Korea: Theater Masks (Barnsdall Art Sundays), Junior Arts Center at Barnsdall Art Park, Hollywood/Los Feliz, Sunday, 10/7, 10:00 a.m. – 12:00 p.m. Every Sunday art instructors present a free art project featuring a different culture and media. All materials are provided. See website for more details. 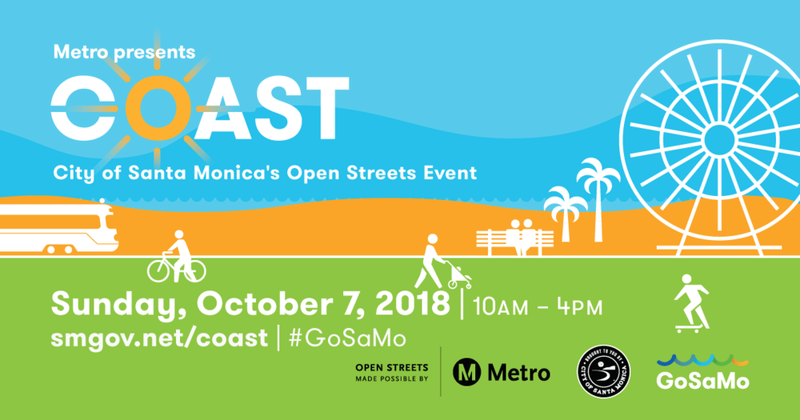 COAST , Downtown Santa Monica, Sunday, 10/7, 10:00 a.m. – 4:00 p.m. COAST, the city of Santa Monica’s third annual open streets event, brings the City’s commitment to art, sustainability and mobility to life by filling two miles of streets with large-scale art installations, interactive activities, music and dance performances, roaming musicians and more! All are welcome to explore Downtown Santa Monica by foot or any number of wheeled devices. 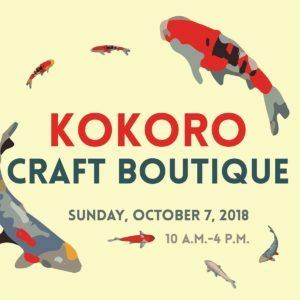 10th Annual Kokoro Craft Boutique, Japanese American National Museum, Little Tokyo, Downtown LA, Sunday, 10/7, 10:00 a.m. – 4:00 p.m. Vendors will be on hand with unique jewelry, kimono fabric fashions, cultural t-shirts, handbags, ceramics, origami, bronze and glass art, Giant Robot products, and more. Enjoy a Taiko performance by Yuujou Daiko at 1:00 p.m. Admission to the boutique is free. A $20 purchase gets you free museum admission (10/7/18 only) and a 10% discount at local participating Little Tokyo eateries during the month of October (some restrictions apply). 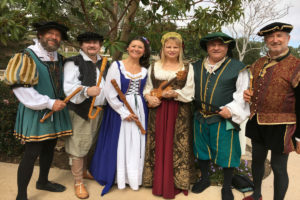 Italian Renaissance Festival, Bowers Museum, Santa Ana, Sunday, 10/7, 11:00 a.m. – 3:30 p.m. Immerse yourself in a real Italian Renaissance Faire complete with special sword demonstrations, interactive gallery experiences, face painting, and musical performances. Experience the thrill of knights in armor demonstrating historical dueling techniques and walking throughout the galleries, Western Martial Arts interpreters, and fashion experts dressed in Renaissance garb appropriate to the region. Using an array of period instruments, live music will be provided by Courtly Noyse. 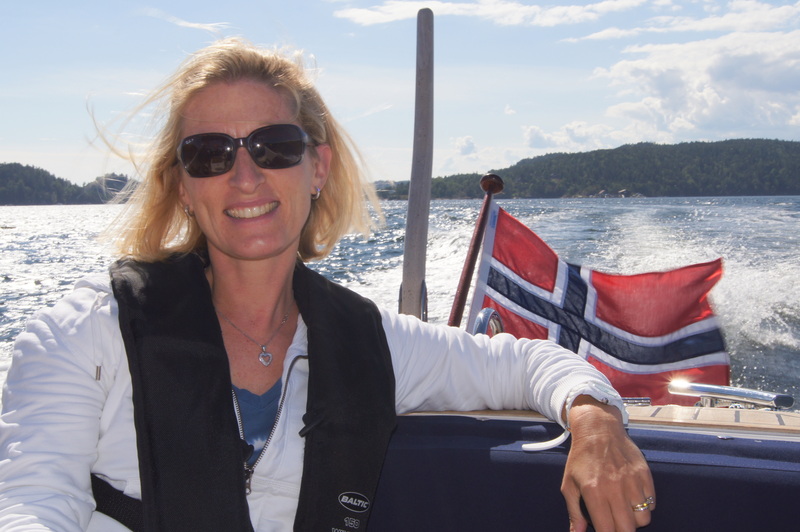 Leif Erikson Day Celebration, Scandinavian Center at Cal Lutheran University, Thousand Oaks, Sunday, 10/7, 2:00 p.m. Judith Vinje, a world traveled journalist and expert in Viking history, will be the featured speaker at the Leif Erikson Day presentation. The presentation will be followed by a reception at the Scandinavian Center. This will be a fun opportunity to see the Scandinavian museum, library, resource center, and programs offered to members. Leif Erikson will be at the Center for pictures and conversation, so be sure to bring the kids! The event is free of charge. Scandinavian AutumnFest & Höstmarknad Celebration, Vasa Park, Agoura Hills, Sunday, 10/14, 9:30 a.m. – 5:00 p.m. AutumnFest offers a wide range of activities for the whole family. 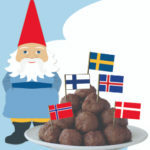 In addition to enjoying traditional foods of Sweden, you can be a judge in the 10th Annual Swedish Meatball Contest. You can buy beautifully crafted gifts and souvenirs and enjoy Scandinavian musicians and folk dancers, demonstrations, and a Viking reenactment group that shares stories about Viking times. There will be many activities for kids including a waterslide, an alpine tube slide, swimming, a rock climbing wall, and field games. Peru: Incan Sun God with Foil and Beads (Barnsdall Art Sundays), Junior Arts Center at Barnsdall Art Park, Hollywood/Los Feliz, Sunday, 10/14, 10:00 a.m. – 12:00 p.m. Every Sunday art instructors present a free art project featuring a different culture and media. All materials are provided. See website for more details. Weaving & Film, USC Pacific Asia Museum, Pasadena, Sunday, 11:00 a.m. Watch Artist Yan Zhang demonstrate the unique Li Brocade weaving style and then try decorative weaving yourself! At 3:00 p.m., join filmmaker Xiaowen Zhu and documentary subject Kenneth Wong for a screening of Oriental Silk, Zhu’s short film on the history of the first silk importing company in Los Angeles. 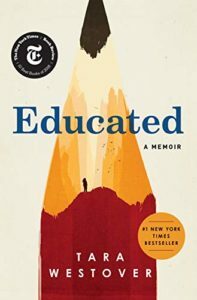 Explore themes of cultural value and traditional craftsmanship, estrangement and homesickness, and the colors of memory. Ancient Egypt: Tomb Paintings (Barnsdall Art Sundays), Junior Arts Center at Barnsdall Art Park, Hollywood/Los Feliz, Sunday, 10/21, 10:00 a.m. – 12:00 p.m. Every Sunday art instructors present a free art project featuring a different culture and media. All materials are provided. 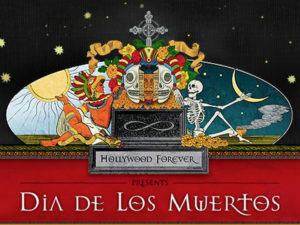 Fowler Families: Celebrating Día de los Muertos, Fowler Museum at UCLA, Westwood, Sunday, 10/21, 1:00 p.m. – 4:00 p.m. Prepare for Día de los Muertos (Day of the Dead) at the Fowler Museum. Celebrate the Mexican cultural tradition of honoring departed loved ones through music, dance, regalia, and storytelling by the LA-based group Xipe Totec Danzantes Aztecas. Originating in Mexico City, this ensemble has developed with the blessings and recognition of traditional elders in Mexico. Xipe Totec Danzantes Aztecas will present “Journey to Mictlan,” a dance piece conveying the Aztec view of death as a transition in life’s journey. Begin the afternoon by creating your very own tissue paper marigolds or contributing to a collaborative papel picado banner that will be displayed in the Davis Courtyard. Xipe Totec Danzantes Aztecas will begin their performance at 2:00 p.m. with a blessing in the exhibition Intersections: World Arts, Local Lives before progressing into the Fowler Amphitheater. Asian World Film Festival, Culver City, Wednesday, 10/24 – Thursday, 11/1. The Asian World Film Festival brings the best of a broad selection of Asian World cinema to Los Angeles in order to draw greater recognition to the region’s wealth of filmmakers. The festival screens films from 50 countries across Asia spanning from Turkey to Japan and Russia to India. This year’s theme will focus on female empowerment. 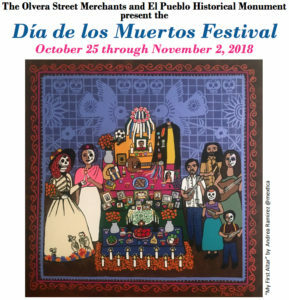 Día de los Muertos Festival , El Pueblo Historical Monument, Downtown LA, Thursday, 10/25 – Friday, 11/2. Olvera Street is home to a colorful celebration that takes place over nine days. Merging ancient traditions with modern-day interpretations, you are invited to join in honoring deceased loved ones. Each evening, colorful and vibrant novenario processions take place at 7:00 p.m. The traditional, pre-Columbian procession evokes special memories of deceased loved ones with colorful pageantry and indigenous blessings. Pan de muerto (sweet bread) and champurrado (a Mexican hot beverage) are provided after processions. During the festival days on the weekend, there is entertainment and face painting throughout the day. Community altars, or “Las Ofrendas,” are on display in the plaza. Día de Los Muertos 2018: Coatlicue “Mother of Gods”, Hollywood Forever Cemetery, Hollywood, Saturday, 10/27, 12:00 p.m. – 12:00 a.m. Spend an eventful day watching as the cemetery comes to life with joyful celebrations. Highlights include a vibrant traditional procession with traditional Aztec blessings and regional musical dance group dedications, 100+ altars created by members of the community to their ancestors and loved ones, four stages featuring music and theatrical performances, an art exhibition in the Cathedral Mausoleum, and a wide variety of Day of the Dead arts and crafts available for purchase. See website for complete schedule and ticket information. JAM Session: Mexican Folk Dance, Burton Chace Park, Marina del Rey, Saturday, 10/27, 3:00 p.m. (Part of Marina Spooktacular) Delight in the vibrant music and dance of Veracruz! Step up on the tarima (wooden dance platform) with Ballet Folklorico Ollin who will walk you through this rhythmic dance style. The JAM will end with a fandango celebrating the entire community. Wear comfortable clothes and shoes. JAM Sessions are participatory while also centered on movement and music. All JAMs are free. All ages and skill levels are welcome. JAM Session: Aztec Dance, Burton Chace Park, Marina del Rey, Sunday, 10/28, 12:00 p.m. (Part of Marina Spooktacular) Experience the splendor of the Aztec people with Danza Mexica Cuauhtemoc. Create rhythms and beats with fellow drummers and explore the music, choreography and poetry of this ancient Mesoamerican culture. Wear comfortable clothes and shoes. JAM Sessions are participatory while also centered on movement and music. All JAMs are free. All ages and skill levels are welcome.